OSWEGO, NY – Sarah Brown is a typical Oswego High School junior, with one exception. Her business acumen is well beyond her age. She owns and operates her own business – Fancy Faces, a face (and body) painting enterprise. It’s not the regular face painting you usually see, she explained. Sarah Brown's creations can be a nasty injury . . .
“I do elaborate designs and full-face masks. 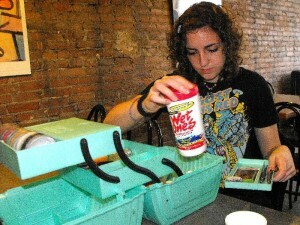 I can also do pregnant belly painting and gore makeup,” Sarah told Oswego County Today.com recently. She does birthday parties or other occasions and takes special appointments around Halloween time. Her prices vary; usually she charges around $50 for a party of 15-20 kids. She took a ‘gore’ makeup class last summer to learn how to make bruises and other injuries for the theater or Halloween costumes. “It was about a week long. It was pretty cool,” she said. The teen entrepreneur has had her own business for a little over a year now and said business is going well. “I was 14 and trying really hard to get a job but I couldn’t get hired. I went to the Renaissance Faire and I saw the face painters and I thought it was really cool. I asked them if I could have a job and they said no, too,” she said. She started with Harborfest 2009. They let all the artists set up in an area for free, she said. “It was right after that that I went out and got a DBA,” Sarah added. “I have always liked art, loved to draw. I have been an artist since I was little really. It’s something really fun to do,” she said. She has taken several art classes in school, including some from Melissa Martin. “She’s my favorite teacher, I really enjoy her classes. I learned a lot from her,” Sarah said. 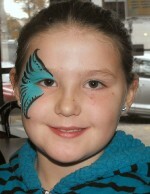 Sarah was the subject for her first face painting. She has even done more elaborate body art like this one for an expecting mother. “I went and got the cheapest face paint I could find and used a mirror. I painted myself as a tiger; it took about an hour or so because I really didn’t know what I was doing,” she recalls. Now she uses paints specifically made for face painting. “A few people had some hygiene questions regarding the paints and stuff. 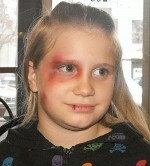 All my products are non-toxic, non-allergenic and specifically for face/body painting. There is also an anti-bacterial agent in the paint itself,” she explained. She always cleans her supplies after each person and doesn’t re-use sponges. Sarah uses Kryolan, the brand commonly used by professionals and occasionally Mehron. Both paints are kid safe, she noted. Usually one or two washings with warm water and soap will remove the face paint. “They come off with warm soap and water. I’ve never had a problem removing paint, but if someone does or it appears to have stained the skin, they can use some baby oil with soap,” she pointed out. 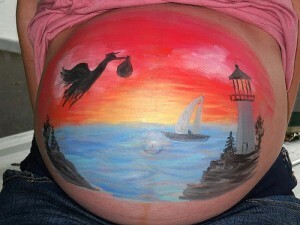 One of the more unique paintings she’s done is a stork carrying a bundle of joy with the lighthouse in the background – painted on an expecting mother’s stomach. “She just called me out of the blue one day and asked me to do it,” Sarah said. She works when others are having good times at parties, Harborfest, the farmers’ market and other special events. When she does have some free time she enjoys roller-skating and drawing. It takes “significantly less time” to create some of the smaller face artworks than her elaborate full-face designs. Sarah doesn’t recommend face painting at a party outside on hot and humid days. If the kids run around and sweat, the paint will run, she noted. Some of the younger kids get disappointed when that happens and their face paint doesn’t last as long as they hoped, she said. The face paint will last quite a long time. “Some kids tell me they wear it to bed and wear it to school the next day. It might be a little smudgy. I don’t know, I’ve never tried it,” she said. The largest party she’s ever done might have been maybe 50 kids, maybe, she said. Clean up doesn’t take her very long, just a few minutes to wash her brushes. If she’s at a fair or some other event it takes longer because she has to also take down her tables, chairs and tent. One of Sarah’s biggest supporters is Danielle Hayden of the Greater Oswego-Fulton Chamber of Commerce. Will her business grow and continue through her college days and beyond? “I don’t know for sure yet. It’d be nice. I’d love to keep doing this. But, I haven’t thought too much about it,” Sarah admitted. In the next five to 10 years she said she sees herself still involved with anything that has to do with art – maybe a makeup artist or in graphic design or maybe an art teacher.